Amid one of the largest global energy gluts in decades, no energy products have been spared from sluggish demand and protracted oversupply. Coal is deemed to have hit a terminal decline while oil producers are reeling from the loss of profits as they struggle to breakeven. Even though it has not dominated the discourse, natural gas has not been immune from the price developments in the sector. Prices have now hit the lowest levels since 2001 as concerns rise about the pace of extraction and output from major producers. The outlook for natural gas remains weak considering the size of new discoveries and warmer winter weather conditions which have seen reduced demand for heating needs. In similar form to the oil industry over the past 5 years, the natural gas industry went on an investment bonanza, using cheap financing to develop projects that otherwise might not be viable. Technology proved a game changer with the horizontal fracturing process unlocking vast potential oil reserves while also revealing pockets of natural gas to be exploited. Shale gas now accounts for over 60% of American production, up from 10% in 2007. Proven reserves continue to rise as the pace of new discoveries continues to weigh on prices despite the rising popularity of gas in meeting US energy needs. In the wake of a 1-year loss of -51.49%, natural gas production has not slowed after hitting a record during the summer, currently standing at 73 billion cubic feet per day as of the latest estimates. Demand remains well below levels a year ago, contributing to the worst losing streak in the energy product since 2014. On a seasonal basis, prices are typically sensitive to weather conditions, especially colder temperatures in the winter months. However, with the El Nino pattern bringing warmer conditions to the United States, gas for delivery from Henry Hub tumbled as low as $1.793, marking levels lower than the last financial crisis. Aside from weather conditions, inventories remain well above average levels as a result of weaker demand. Currently, inventories stand at 3.88 trillion cubic feet with Thursday’s Department of Energy storage figure to provide further details on the state of supply for natural gas. 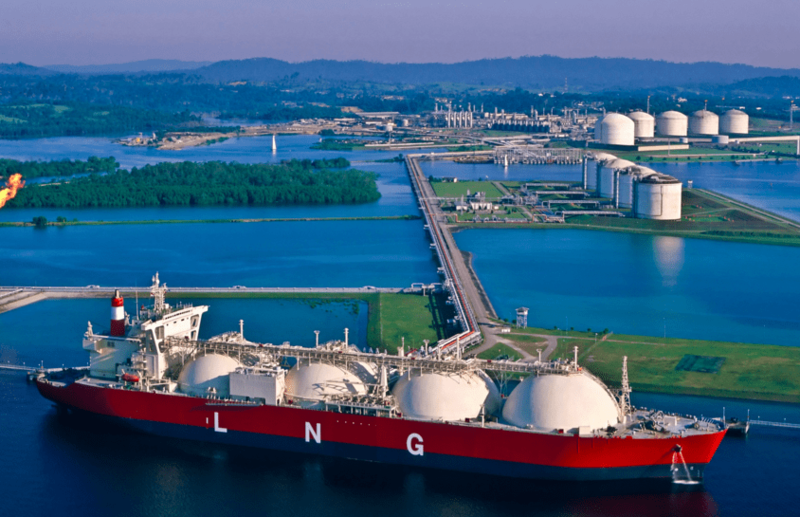 One development that could change the long-term dynamics of the domestic US gas market is the construction of LNG export terminals. This could very well open up the global gas market to US producers, evening out the price differentials that have kept prices notably weaker domestically. While there is a glut at the moment of gas globally from the onboarding of LNG facilities, over time, especially with the climate deal, natural gas is forecast to play an increasingly important role in energy production across the world. Even though producers might be under pressure considering the current pricing which leaves many companies at or below breakeven, the long-term outlook is positive for the industry and prices will eventually rebound higher. While currently in one of its worst losing streaks in over a year, after sinking 7 of the last 8 session, natural gas might have overshot to the downside from a technical perspective. A relative strength index not far from the 20 level indicates that gas prices are demonstrably oversold and a reversal might be just around the corner. Based on the lacking price momentum early in the session, the energy product might be vying for a rebound, mirroring the pullback in crude oil. Since 2014, the moving averages have largely acted as resistance after the 50-day moving average crossed the 200-day moving average to the downside, indicating a bearish pattern known as the “death cross”. 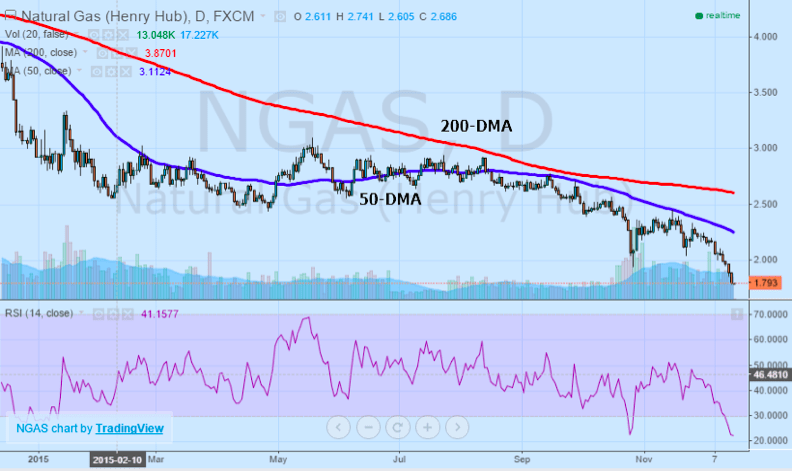 Since then, prices of natural gas have been halved, and currently trades below both moving averages. Based on the recent price momentum lower, a correction higher is in the pipeline and will likely be a swifter move than the prevailing bearish trend currently facing natural gas. Waiting for a pullback to initiate Put positions is suggested after prices rise from current levels, targeting 1.950 on the upside before a resumption of the longer-term downtrend. Should prices manage to climb above this resistance, Call positions are suggested with the target of 2.040 but any move over 2.180 could be considered a reversal in the trend and indicate potential for more upside. However, this scenario is highly unlikely, and investors should be looking to fade rallies with Put positions in order to maximize potential value. Although natural gas prices have been beaten up recently based on a confluence of negative factors weighing on the near-term outlook, over the longer-term there is room for a rebound in prices despite the prevailing supply and demand conditions. However, until weather conditions or inventories make a marked shift, the propensity for a substantial upside rally remains elusive. Instead, upticks in natural gas should be considered an opportunity to initiate new Put positions targeting new lows. However, as the United States and other advanced economies move away from dirtier energy sources on a longer-term basis, natural gas will play an important role especially if LNG export terminals come online opening US production to the global economy.